A Little Bird Told Me tops the charts in a cover version by Evelyn Knight and inadvertently opens the door for the wholesale ripping off of black-originated songs by white artists. The original recording was done by Paula Watson on Supreme Records, a black-written (by Harvey Brooks) and sung (by Watson) record on a black owned (by Al Patrick) label. It was a light frothy tune as written, certainly not rock in any way, which Brooks had originally offered to white bandleader Woody Herman who turned it down. When Paula Watson became the first to cut it she sang it with a syncopated beat and added a certain soulful quality at times in her delivery inching it a little closer to the emerging rock sounds, though its whistling section helps to keep it firmly within the pop realm. Decca Records, perhaps the most powerful of the major labels, heard it and immediately covered the song with white singer Evelyn Knight, who imitates every nuance of Watson’s vocals while the arrangement is a carbon copy of the original. Though covering current hit songs was standard practice at the time for all artists, white and black, the blatant duplication of every aspect of Watson’s original cost tiny Supreme Records much needed sales. As a result they brought a $400,000 lawsuit against Decca for plagiarizing the entire record. The decision itself may well have been legally justified (the argument being that there had to be deception in which version was which and by virtue of the prominent labels of each company with their names and the artists on them, that clearly wasn’t the case, at least in terms of retail sales, although radio broadcast may have been less clear), but the real travesty was in the clearly racist mindset that hung over the decision. In summary Judge Leon Yankwich declared that Watson’s original “lacked inspiration” even though it was original and Knight’s was not and that it contained “just the usual accompaniments and the usual intonations which one would find in any common recording”. On the other hand he praised the Knight version for its “more precise, complex and better organized orchestral background” as well as Knight’s “clearer intonation and expression”. In the end he called Knight’s a “much better product”, in essence dismissing the black experience and perception entirely in justifying his decision. In other words, white made right, even in the eyes of the law. With this case setting precedent larger record companies were granted unlimited clearance in churning out near duplications of records from independent labels which over the next decade meant rock songs were facing an uphill battle in succeeding in the broader marketplace. Snow falls in Los Angeles! Between January 9th and the 12th the semi-tropical paradise of Los Angeles, California got hit with a snowstorm, a rare occurrence that left Los Angelenos in a state of shock. With temperatures in the twenties for three days straight it gave them the chance to build snowmen, have snowball fights and learn how to drive – and crash – their cars in slushy conditions. Students at UCLA even tried skiing! 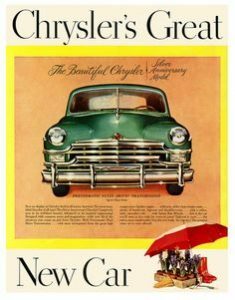 Radiators froze and Bing Crosby’s engine block in his Caddy did as well, forcing der Bingle to get a ride with common folk back to town. Portions of the Pacific Coast Highway were shut down for safety reasons. Twenty cars were trapped in Laurel Canyon, unable to move through the white stuff on the roads. 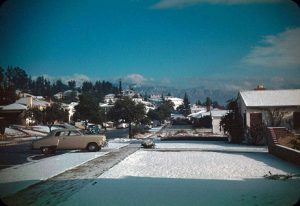 Though hardly a blizzard, the total accumulation being just a half inch in some locales, other areas were hit harder with the San Fernando Valley seeing almost a foot of snow. Those totals remain a record for the region which hasn’t been snowed on again since 1962. The average yearly income for families in 1949 is $3,600. Minimum wage is 40 cents an hour. Thirty six percent of men earn over $2,500 per year, whereas just 12% of female workers make that much. 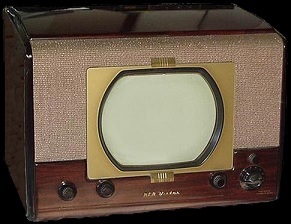 Television ownership reaches 700,000 sets at the start of the new year, double what it had been just six months before. The linking of the east coast, where almost all television programs originated, and the Midwest via a newly installed underground coaxial cable that was completed this month allowed an ever greater part of the country to see the shows that were being made in New York at the same time they aired locally, thus marking the true birth of a national “network” of stations which all carried the same programming at the same time. No longer just an east coast phenomenon television was now expanding at a rapid pace with new stations appearing all over the country each month. The mania over television viewing results in plummeting ratings for radio broadcasts, while nightclubs, movies and reading also see rapid decline as popular leisure time activities. Chrysler introduces the ignition key starter for cars, enabling drivers to start the engine by simply turning a key rather than also having to press a button on the floor or dashboard. Of course as convenient as this is it had its drawbacks as well, such as the lengthy delays that occurred when you lost your keys and spent a half hour yelling at your spouse, your kids and the pet parakeet as you stomped around looking in the same three places you already looked for that elusive key, eventually forcing you to take the bus instead… if you can just find your wallet now. As always Health Insurance is a big expense and so it helps to know what your coverage consists of so you won’t be caught short should a medical calamity strike you. For $1.50 a month the North American Mutual Insurance Company provides you with peace of mind that comes with financial reimbursement for sickness and hospitalization. Should you be hospitalized your insurance will pay you six dollars per day up to thirty days! A visit to the emergency room will get you ten dollars to cover their costs. Operations resulting from injuries or sickness will pay ten to a hundred dollars depending on the surgical procedure. Better still, if you happen to lose an eye, hands or feet due to a mishap your insurance will pay you $500 to $750 and if you should die your survivors will get a cool thousand dollars… or twice that if your death resulted from being a fare paying passenger on public transportation! For just sixteen dollars a year that’s a lot of money you can come into with a little luck… or lack thereof. One sure way to see to it that you never need to collect on your health insurance’s death benefits is to steer clear of winter colds. 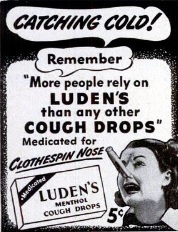 But that’s easier said than done and so if you do happen to be inflicted with a cold why don’t you try easing your symptoms with Luden’s Cough Drops. The most popular brand of menthol cough drops relieves the dreaded “clothespin nose” which is the leading cause of death among those with bad winter colds. At just five cents this remedy is far cheaper than the expense of health insurance.